Few men dare ask the question "What is toffee, exactly?" All those who have investigated this substance are now either dead or insane. Some H.P. Lovecraft aficionados are making a silent film of The Call of Cthulhu, executed in authentic 1920s/30s silent movie fashion. There's a trailer online, which looks promising. The Great Old Pumpkin, or what happens when H.P. 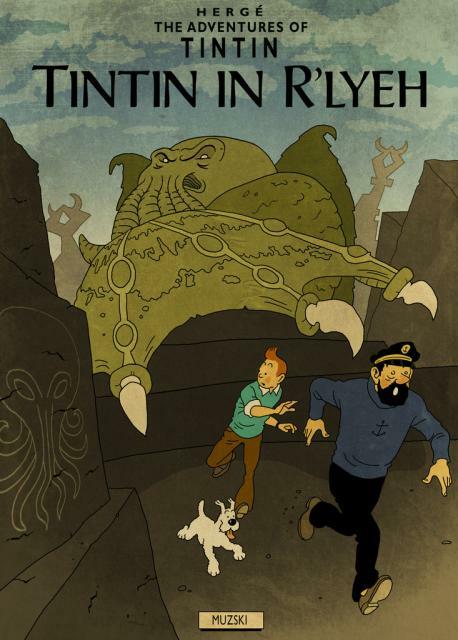 Lovecraft meets Charles Schultz. And, from the same site, Prisoners of Uqbaristan, a collision between hyperpatriotic American techno-thrillers and Jorge Luis Borges. I haven't been posting much recently, having too much to do (upcoming travel plans and such; more about these later) to sit down, graze on the various memestreams and produce links, opinionated comments or sarcastic asides. Anyway, I recently had occasion to reread H.P. Lovecraft's The Shadow over Innsmouth for the first time in many years, after reading that Zachary Marsh LiveJournal thing (which, after all, was a riff of it). In my opinion, The Shadow over Innsmouth is one of HPL's better stories (alongside the one about the Fungi from Yuggoth, the mind-abduction one about the Great Ones and, for sheer horror, The Thing On The Doorstep); the two-part structure, with the standard escape-from-a-city-of-monsters thing being followed by the far more disturbing realisations that the narrator is one of them, works very nicely. However, in my reassessment, it hasn't aged well. For one, Innsmouth is predicated on xenophobia. The Deep Ones are nothing more than an evil race of monsters, surrounded by decay and worshipping loathsome gods; they have no positive attributes (except for the beautiful yet disturbingly alien jewellery), and as much substance as the monster under one's bed when one was a child, only with more gruesome detail. Towards the end, the narrator reconciles himself with joining the Deep Ones and their loathsome rites, but it seems insincere, as he doesn't shed any light on the experience of the Deep Ones. (And those things being inherently incomprehensible to humans is a cop-out; amphibious humanoids descended from a common ancestor with humanity and possessing families, language, a culture and a society would have had some common ground with humans, even if their culture and their biology would seem profoundly alien.) It would have been much more powerful had the point of view shifted from the human one (of visceral revulsion) to the Deep Ones' one (with the bizarre consequences of their biology, society and culture gradually revealed) would have been far more interesting. 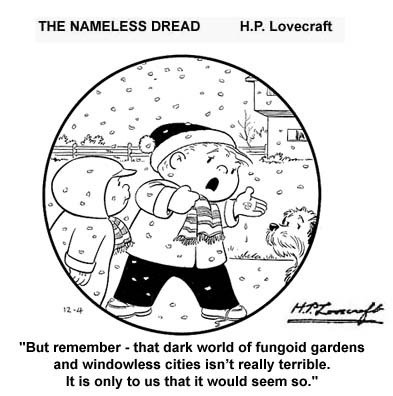 I suppose the flaw comes from Lovecraft being, if taken as a writer of speculative fiction, lazy; not bothering to create a plausible alien world when an unspeakable, blasphemous horror (which, by virtue of being unspeakable, also saves the author the effort of describing it) will suffice.